There’s big and then there’s enormous. Perhaps that’s what the E stands for in ESV, as in my tester for the week: the 2015 Cadillac Escalade ESV. What makes this Escalade an extra Extra Special Vehicle (see what I did there) is its size and stature. The Escalade is a full-size, luxurious SUV. In fact, on the Mt. Rushmore of luxury SUVs, the Escalade is George Washington. But the Escalade ESV is bigger, bolder and more aggressive looking than regular Escalade. 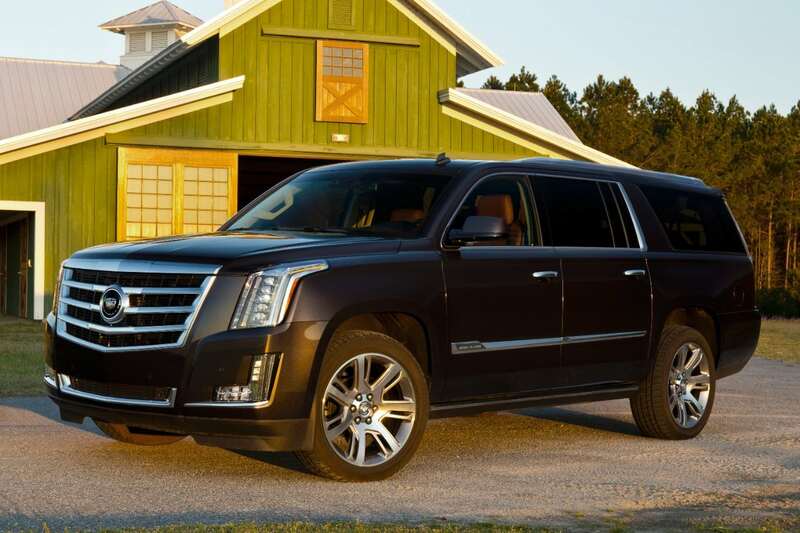 Remodeled for the 2015 model year, the Escalade is now in its fourth generation. Some of the new features of the Escalade ESV include a new grille featuring LED lighting, more spacious interior and new fold-flat second and third-row seats. It’s that flashier grille that makes the Escalade stand out. A prominent and elegant exterior is further embellished with chiseled styling that holds true to that Cadillac Escalade profile. The Escalade is a big SUV, the Escalade ESV is a behemoth! 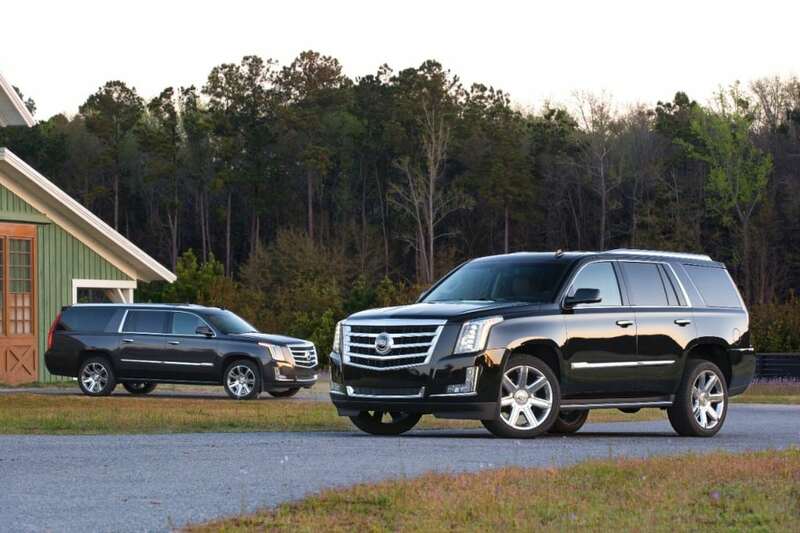 The Escalade ESV is comparable in size to the Chevy Suburban. The ESV is 14 inches longer than the regular Escalade and the third row legroom is the benefactor. Third-row passengers will gain an incredible 10 inches of space and even cargo space behind the third row is improved. All told, the ESV has 120.9 cubic feet of cargo space. The ESV is a seven-passenger SUV, but has a second-row bench seat that allows for an eighth passenger. My tester had the second-row captain seats. 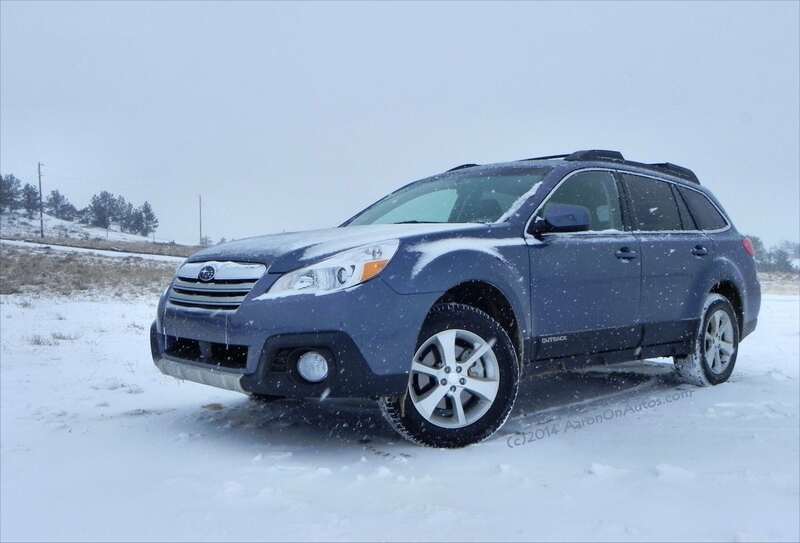 A huge improvement to this model year is the power-operated third row seats which now fold flat in a simple process (so you can utilize that immense cargo space). Under the hood, the Cadillac ESV has ample power. A 6.2-liter V8 engine powers the SUV and produces 420 horsepower and 460 lb./ft. of torque. A six-speed automatic transmission is mated to the engine. All of this power and performance helps the Escalade tow up 7,900 pounds making this both luxurious and useful as a weekend warrior. Driving this bigger Escalade is a challenge. There’s nothing agile or nimble about its performance. You can really tell the difference in size as you’re navigating down the highway. And because of the added dimension, parking can be a challenge with the Escalade ESV. But inside, you’re in the lap of luxury. Every detail is well crafted and well thought out in the Escalade ESV. Soft touch points and high-quality materials are found throughout, even in the second and third row. Real wood accents really put the luxury over the top and show that this is not just a glorified, overpriced Suburban; this is a Cadillac through and through. The Escalade comes with Cadillac’s CUE entertainment system that can be cumbersome, but also has many excellent features. Now that I know all the perks of CUE, I thoroughly enjoy it. I enjoyed it even more thanks to the 12.3-inch high-resolution driver information center display. As mentioned (numerous times), the ESV is a bigger version of the Cadillac. The interior space is noticeably bigger and more comfortable. Second row headroom is a vast 39.1 inches with 39.7 inches of legroom. Front headroom is even bigger with 42.8 inches of space and 45.3 inches of legroom. Make no mistake, the Escalade ESV is not a fuel sipper. However, thanks to direct injection technology in the engine, GM claims a 17 percent increase in highway fuel economy for this model year. 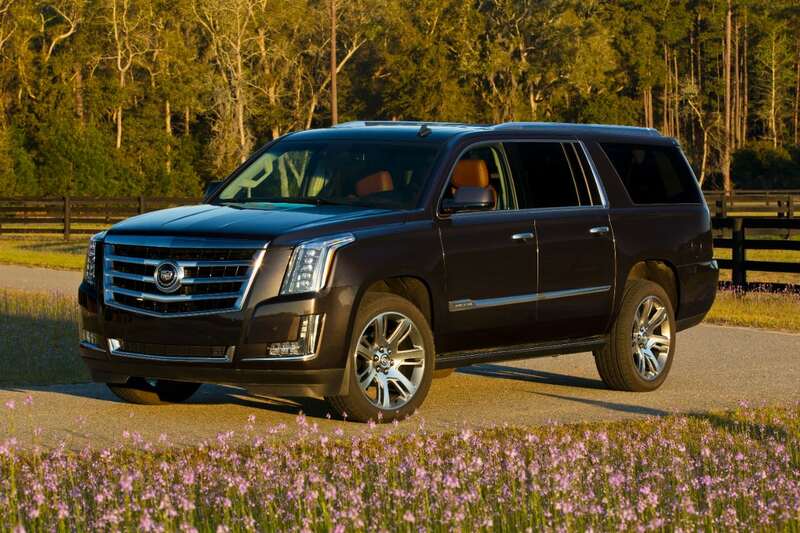 The Escalade ESV has an EPA rating of 14 mpg/city and 20 mpg/hwy. In a week’s worth of mixed driving, I was pleasantly surprised with the fuel economy. I averaged 18.7 mpg. There are three trim options for the ESV. My tester was the middle trim option – Luxury. 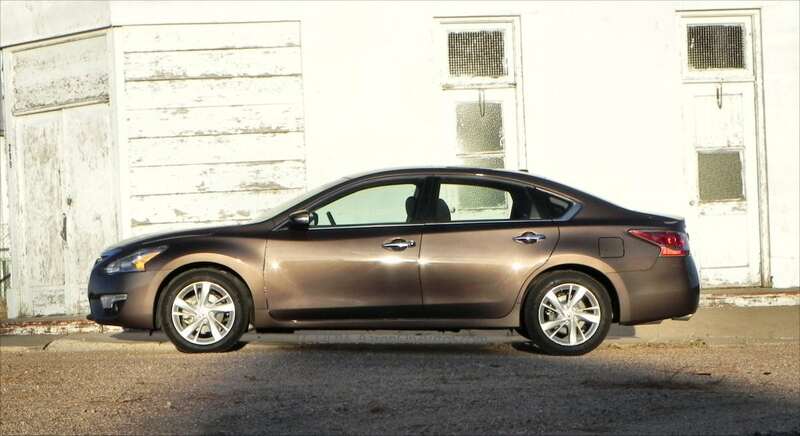 With this trim you get 22-inch wheels, a sunroof, the aforementioned power-folding seats and sensor-based safety features like blind spot monitoring, lane departure and front collision warning. Standard price for the Escalade ESV Luxury is $81,295. With a few more options added, my tester had the final MSRP of $84,290. That’s certainly a big price tag for a big SUV. The 2015 Cadillac ESV makes a bold statement. In today’s world of super sizing, it’s nice to have it as an option when you want to upsize your luxury SUV.